Maggie Fangmann adores things that have history, whether it’s the former mining town where she lives or the tradition of knitting in her family. She can trace their love of needles and yarn back to her great-great-grandmother in Denmark. And she’s adding to that history with every new design. 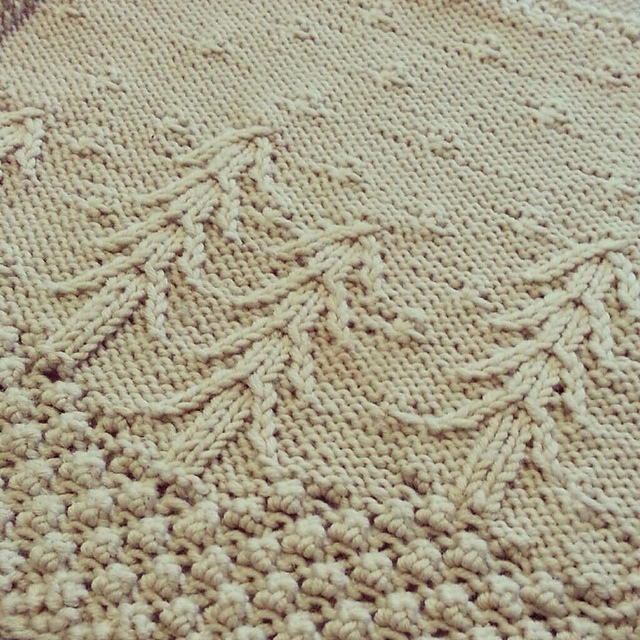 January Snow is an afghan block that Maggie designed for a mystery knit-along at her LYS. The 10.5 inch square features a wintry scene, using blackberry stitches for mounds of snow and cables to create pine trees. Maggie had only planned to design the first of twelve blocks, but ended up taking on the whole blanket to ensure a cohesive look. Knit in our Vintage yarn, each square will depict a different outdoor scene. This block is free until the end of the month (don’t miss out!). New blocks will be released the first Tuesday of each month. I thought of January and what reminded me of it the most. Having previously lived in the mountains, I thought of snow and the beautiful pine trees. Nothing compares to the peaceful scene of snow piled freshly upon the ground with flakes of snow falling gracefully down from the sky. Truthfully, I made it for myself. I love trees and want each block released this year to reflect their beauty in one way or another – something I can enjoy for years to come, but that will relate to others, whether they live in Utah or elsewhere in the world. I knew the yarn would be worsted weight and there are two yarns I just love at the LYS I work at. Berroco Vintage was one of them and it is great for a large project like this. You can easily wash it and it wears well after doing so many times. My best disaster story is when I decided to be brave and knit myself an intricately cabled vest. I followed the instructions down to the last bind off and ended up with a vest (after blocking) that was 3.5’ across when laid flat and came up to my belly button. I tried to block it again to make it longer and skinnier, but it just wouldn’t do it. One day I will felt it into a bag, but for now it reminds me that sometimes you just need to modify a pattern as you knit it to fit yourself. I love the freedom of it and how it takes away your stress. My grandma used to say each stitch was a worry off her shoulder and I could never understand why she said that until I started knitting myself and became comfortable with the process.